Going to the theater with a six-year-old can sometimes be problematic. Either the movies available to see at the time we’d like to go or too adult for her or too young for us. It’s often hard to find a film that fits middle ground. 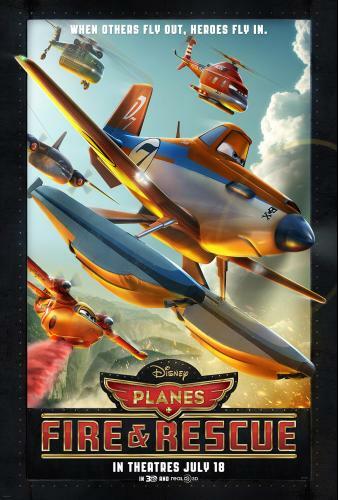 Today, I’m excited to say that Disney’s Planes: Fire & Rescue opens in theaters. Planes: Fire & Rescue puts Dusty Crophopper (voiced by Dane Cook) in one of the most difficult situations a person might face in his or her life: the challenge of having to reinvent oneself after being told he is no longer capable of doing the thing he loves most in life. For Dusty, that’s flying and racing. But after his engine gives out, he’s told it cannot be repaired and that he will never be able to race again. Dusty must find some new direction for his life, and so he becomes involved with a group of aerial firefighters. Dusty will still get to fly and he will still experience adrenaline rushes, but what he will be doing also has the power to save lives. Team leader Blade Ranger (Ed Harris) and his mismatched crew all have their own stories about how and why they reinvented themselves, and sharing their personal experiences with Dusty allows him to begin the healing process. Watching Planes: Fire & Rescue brought me back to my childhood to so many of the drives I went on with my parents from Illinois to Nevada. I have a few memories of visiting Yellowstone National Park, which was one of the parks that the Disney team modeled the fictional Piston Peak after. Adults and children alike will be glued to the screen during the breathtaking shots of the park, which really pop with color and vibrancy. 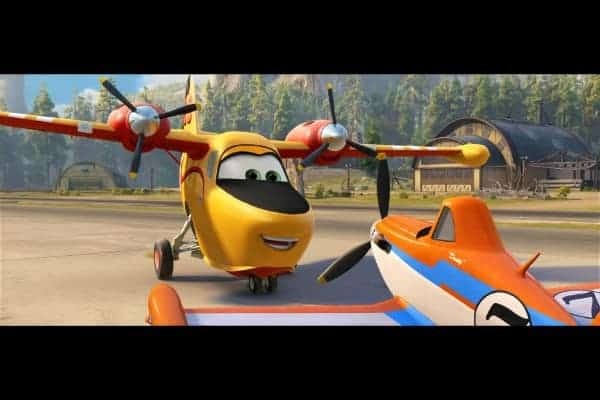 For the moviegoers who love action sequences, Planes: Fire & Rescue features them in abundance, right from the opening scene of the movie. Though the storyline is a bit more dramatic than Planes, there is plenty of comic relief provided in the character of Dipper (voiced by Julie Bowen), who creates an imaginary relationship with Dusty. She was by far one of my favorite things about this film. 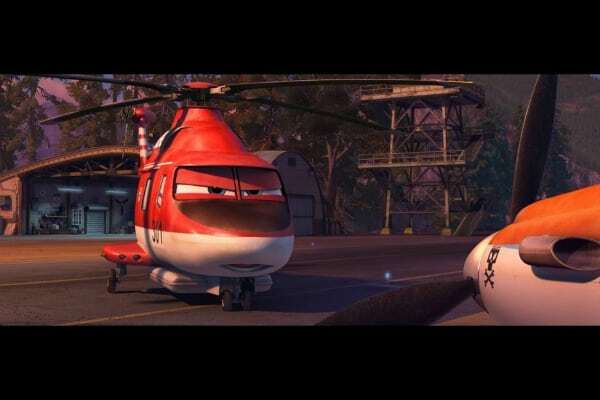 Planes: Fire & Rescue also presents quite a few hidden surprises and even a nod to a famous beloved TV show. Although I wasn’t the right demographic for that particular TV show and have actually never seen it, its brief inclusion in the film will be sure to delight grandparents who might end up taking their grandchildren to see the film. All in all, Planes: Fire & Rescue is sure to be a hit with everyone in your family—children will love the quirky new characters, moms and dads who love action films will clutch the edges of their seats during intense moments, and anyone with a sense of humor will find themselves falling for Dipper’s offbeat personality. 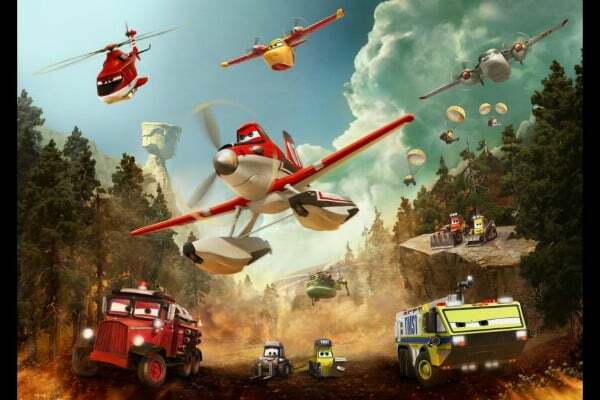 Keep up to date on all things Planes: Fire & Rescue on Facebook and Twitter. This action-packed adventure is in theaters everywhere July 18th! Super excited to see this with my grandkids!! Can’t wait to take my nephew to see this! I’m glad to hear that adults will enjoy it too. There is nothing worse than being dragged to a kids movie that isn’t funny for the grown ups! This is sure to be a hit with children everywhere, thank you for this reminder post. I’m sure my nephews will love this movie. Thanks for the review! I can’ t wait to see this movie with my granddaughter. Sounds like so much fun. The grandkids are looking forward to seeing this on the weekend! My daughter is still a little bit young for this movie, but I think she would like it in a couple of years. My friend’s preschooler was very excited about this movie! Looks like a good movie for kids. Thanks for the review. My grandson would love this.Thanks for the review!